Artist rendition of a mining operation in space. 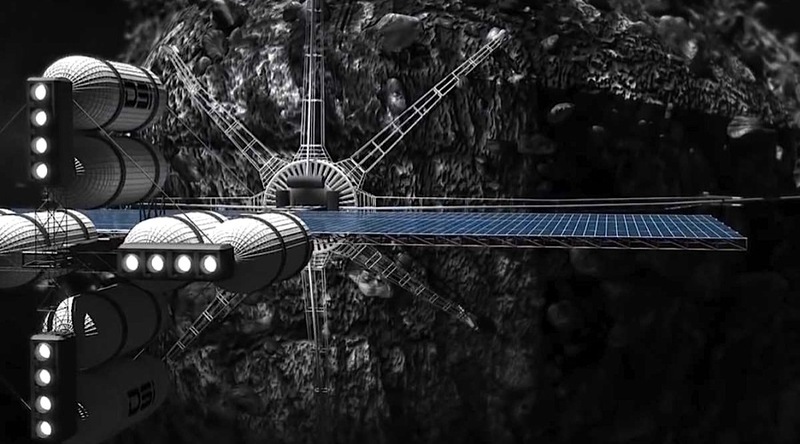 Luxembourg is stepping up efforts to become Europe’s centre for space mining by agreeing to buy a major stake in US-based asteroid miner Planetary Resources. While it was not immediately clear what the government’s initial investment in Planetary Resources Luxembourg would be, the parties said in a statement that the agreement seeks to speed up the development of technologies and lines of business toward the exploration and utilization of resources from asteroids. The government has also opened a $225 million (€200 million) line of credit for entrepreneurial space companies to set up their European headquarters in Luxembourg. The tiny European nation is one of the euro zone’s wealthiest countries and already has a long-standing space industry, playing a significant role in the development of satellite communications. While its drive to become a significant actor in the asteroid mining industry is rather new, the country has already taken major steps towards achieving that goal. On Friday, it announced the opening of a €200 million (US$225 million) line of credit for entrepreneurial space companies to set up their European headquarters within its borders. And last month, the government reached an agreement with another US-based company, Deep Space Industries, which will be conducting missions to prospect for water and minerals in outer space. Both parties are currently developing Prospector-X, a small and experimental spacecraft that test technologies for prospecting and mining near Earth asteroids after 2020. Luxembourg’s administration is also working on a legal frame for exploiting space resources so that private companies can be entitled to the resources they mine from asteroids, but not to own the celestial bodies themselves. The only international legal body available dates back to 1967. The Outer Space Treaty, signed by the US, Russia and a number of other countries, says that nations can’t occupy nor own territory in space. And while a discussion on the matter is bound to happen, countries such as the US, have decided to make their own rules. In November, President Barack Obama signed a law granting American citizens rights to own resources mined in space. The ground-breaking rule was touted as a major boost to asteroid mining because it encourages the commercial exploration and utilization of resources from asteroids obtained by US firms. Geologists believe asteroids are packed with iron ore, nickel and precious metals at much higher concentrations than those found on Earth, making up a market valued in the trillions of dollars. Humans are already going to extremes to get natural resources. Gold and platinum mines in South Africa go as deep as almost 4 km into the Earth’s crust, which is about twice the depth of the Grand Canyon. Meanwhile, up high in the Andes are some of the biggest copper and gold operations in the world. In Peru, La Rinconada is the world’s highest permanent settlement at 5,100 m, and it is situated strategically between many artisanal gold deposits in the mountains. However, there are two frontiers that humans are still exploring in their early stages: the deep sea and spacial bodies such as asteroids, planets, and the moon. Today’s infographic covers the prospect of moon mining. While we often think of the moon as a pretty barren landscape, it turns out moon mining could take advantage of many natural resources present on the lunar surface. Water is vital in space for a multitude of reasons, such as for use in human consumption, agriculture, or hydrogen fuel. It’s also cost prohibitive to transport water to space anytime we may need it from earth. Scientists are now confident that the moon has a variety of water sources, including water locked up in minerals, scattered through the broken-up surface, and potentially in blocks or sheets at depth. Helium-3 is a rare isotope of helium. Currently the United States produces only 8kg of it per year for various purposes. Helium-3 is a sought-after resource for fusion energy and energy research. Lastly, rare earth elements (REEs) are also at high concentrations on the moon. KREEP (Potassium, REEs, and Phosphorus) is a geochemical mixture of some lunar impact breccia rocks and is expected to be extremely common on the moon. This mix also has other important substances embedded, such as uranium, thorium, fluorine, and chlorine. If a lunar colony is indeed in our future, moon mining operations may be an important component of it. As the world’s largest energy consumer, China is deeply aware of the imperative of addressing its energy trilemma – how to simultaneously achieve and balance energy security, energy equity (access and affordability), and environmental sustainability – in the coming decades, and is determined to develop clean and unconventional power to quench its thirst for energy. Indeed, powering an economy the size of China’s, especially by mid-century, solely by burning massive quantities of finite fossil fuels and relying on conventional nuclear power is not a viable option. For this reason, China is devoting considerable resources to the most futuristic and elusive of unconventional energies: nuclear fusion. Most research in nuclear fusion has focused on deuterium and/or tritium (heavy isotopes of hydrogen) as the fuel used to generate the fusion. Deuterium is found in abundance in all water on earth, while tritium is not found in nature but can be produced by the neutron bombardment of lithium. However, nuclear fusion could become much more attainable by shifting to another isotope on the periodic table: helium-3. However, supplying the planet with fusion power for centuries requires that we first return to the moon. At present, only China has this in mind, with its Chang’e program, a lunar exploration program that will send astronauts to the moon by the early 2020s. If Beijing wins the second “race for the moon,” and establishes a sustained human outpost conducting helium-3 mining operations, it would establish the same kind of monopoly that in the past created the fortunes of ventures like the East India Company. The ramifications would be significant, to say the least. First, “China is what international relations scholars call a ‘revisionist power,’ seeking opportunities to assert its enhanced relative position in international affairs,” according to Foreign Policy. Establishing an automated or manned helium-3 operation on the moon would be a spectacular assertion. Second, with the inevitable depletion of fossil fuels on Earth, China would be in a position to gradually build a helium-3 empire in which it would control the supply of the lunar gas. The rise of such an empire would most likely be met with resistance. The prospect of China’s energy supremacy would probably lead to pervasive geopolitical influence, cause geopolitical tension and anti-Chinese alliances to coalesce, and prompt other countries – particularly the U.S. – to hasten to the moon to break the dragon’s monopoly. Still, this scenario is hardly inescapable. On the contrary, lunar exploration and resource development could end up encouraging international cooperation and build confidence. If the spacefaring nations see a common destiny, then creative politics, diplomacy, and new legal frameworks could be used as instruments for good governance and an equitable sharing of the spoils. A new international regime for the joint development of lunar helium-3 would then be viable, with all the possibilities for the planet that would entail. Fabrizio Bozzato is a PhD Candidate at the Graduate Institute of International Affairs and Strategic Studies – Tamkang University (Taiwan). Profiting from the riches that asteroids, stars and even planets have to offer is closer than ever, with two companies launching missions within three years. But experts say before going for the gold, platinum and diamonds that may be up there, they need to find the most precious of all: water. Investors eager to get the new industry off the ground know this. That is why new ventures that have backing from some loaded business figures, and even the NASA, have decided to focus on using space minerals in interplanetary “gas stations.” According to Reuters, the other alternative for them is to build, support and fuel colonies on Mars. Geologists believe that asteroids hold iron ore, nickel and precious metals at much higher concentrations than those found on Earth. In fact, an asteroid that flew by the earth earlier this year had an estimated value of $195 billion in metal and fuel. Scientists have said asteroid mining is a necessity as many metals that underpin our modern economy are quickly being depleted. Without any new technological advances, metals like zinc and gold are expected to run out in 100 years, they claim. So far there are at least two asteroid mining companies —Planetary Resources and Deep Space Industries —and the US National Aeronautics and Space Administration (NASA)looking into the feasibility of the extraterrestrial endeavour. Experts say that while viable, asteroid mining is not and will probably never be a completion for our planet’s industry. The real value in space mineral extraction, they say, is for further space travel – and so hydrogen and oxygen reserves are as attractive as any metal. “It’s ridiculous to believe that asteroid resources will ever compete with terrestrial alternatives and Earth markets,” Brad Blair, a mining engineer and economist, told Reuters. When asked about the planned city-sized settlements on Mars, he noted the reason asteroid mining makes sense is because people might be some day where those resources actually are. “You can’t put an 80,000-person colony on Mars without using the local ‘timber’ (…) and if you’re going to use chemical propulsion, it’s going to take a lot of water to get them there,” he was quoted as saying. You are currently browsing the archives for the SPACE & ASTEROIDS category.